At Testa and Sons Signs, you get beyond a high quality product for promotional, commercial, or personal use. It is our mission to not just supply you with a top of the line product but also provide exceptional customer service, unique custom sign design, proper and secure sign installation, and complete color digital printing sign projects. We believe that being the best means creating the most versatile, detailed, and eye-catching signs while also helping you to feel confident about a product that will act as an important introduction for your business, home, office, street, or general location. A sign can signify and ignite many different moods, from bold to brilliant to urgent to cautious and more! Have your custom signs, promotional signs, dimensional letters, digital printing, and sign projects reveal the concept you want with specific sign design manufactured and installed by Testa and Sons Signs. Standing for original, unique, and creative sign design, we at Testa and Sons Signs want you to have the perfect signage. Whether a street sign needs to be placed in a specific location, you need a new sign up for your business or commercial location, a promotional sign needs to be set, or you are looking for an interior sign in your office, let us help you as the leading custom sign company in South Florida. When it comes to having traffic signs put up that are approved by the Department of Transportation, you can count on Testa and Sons Signs to provide the most unique, innovative, and exclusive street signs. Our custom design with polyurethane backings that support traffic signs and stop signs allows for a clean and transformed look in neighborhoods and on the road. 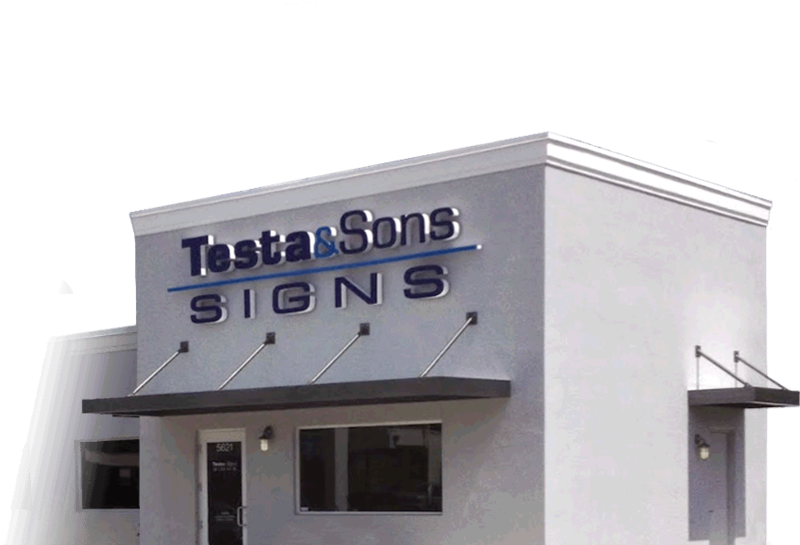 For the best business and commercial signs, turn to Testa and Sons Signs because we can help create the vision you have in mind with a custom sign design. When you envision a specific indoor sign or interior signage, we can bring the mural, signage, or logo to life! Not only this, but we can help to get your business name really pop out with channel letters or sandblasted signs. The options are endless when you go to Testa and Sons Signs for the best custom signs for your business or commercial location. 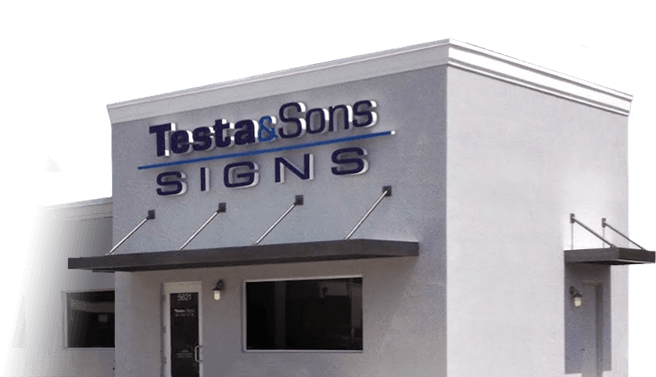 When it comes to having a bold storefront sign stand out, Testa and Sons Signs wants you to have the sign you deserve to get your brand out! With precision, attention to detail, and caution, we work to create a masterpiece that will stay at the front of your store and attract customers. From colored signs to lighted signs to logos, we are your number one leading sign design and installation company. Are you having an upcoming event and looking for a sign design company to create and install promotional signs? Then let Testa and Sons Signs help create the most powerful and appealing promotional sign for you! Whether you need a standing sign, banner, snipe sign, or custom sign made to promote an event, let us be the ones to take care of manufacturing and installing your sign. All types of business environments do well with custom signage! From hospitals to doctors offices to fast food restaurants to fine dining to real estate offices, a custom interior signage can make all the difference. These types of indoor signs allow for a particular tone to be set, whether it’s professional, fun, pretty, fresh, exciting, and so on! Real estate offices can do exceptional with the proper signage leading individuals right through their door. From bold signs to clean cut professional signs, Testa and Sons Signs can make and install the most eye-catching signs to attract new clients. We also can help make your real estate office look glorious with an interior sign that showcases the name, mission, or motto of your real estate company. Testa and Sons Signs is big on innovation, which is why we go beyond custom digital printing and custom design with additional exciting custom sign features. If you are looking for something that really grabs the public’s attention, then a lighted sign is the best option for you! There are several different ways to create the look for lighted signs. One is by having the letters internally illuminated. This can be a great, alluring way to bring customers in, and can do particularly well for nightclubs, bars, restaurants, and such because it is a fantastic mood setter. Alternatively, external lighting for signs can be very impactful. A couple types of external lighting for signs can include external light troughs and swan neck signs. Troughs push light through to the front to create a modern beaming look while swan neck signs are more about lighting being placed on the sign. No matter what type of sign you consider with Testa and Sons Signs, don’t forget about the option for a lighted sign! 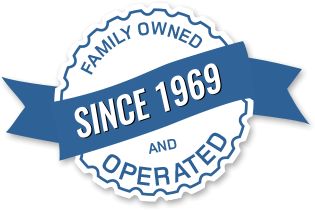 At Testa and Sons Signs, we understand that accidents happen and signs can be damaged. That’s why we extend our services to sign repair. We are able to fix any type of sign, no matter how cracked, broken, or burnt out it may be. Is the event that was listed on your promotional sign over? Has your business or commercial location closed or moved and you need the signage removed? Are you just tired of the outdated sign you have up and are ready for a new sign design by Testa and Sons Signs? No matter what the case, we want to help you by removing the sign. What Makes Testa & Sons the Best Custom Sign Company? Testa and Sons Signage is the best in the custom sign design and installation industry because we care about creating and setting up the best possible product for each customer. We believe in helping our customers have the best signs so they can have the best outcome for their business, event, community, or general location. Creating a sign is more than just about a unique custom sign design. At Testa and Sons Signage, we use precision, proper planning, and dedication to help you get the best product from the greatest custom sign team.